Prior to being selected to serve as Clinical Director for TLC, he was the Clinical Director for Southeastern Laser and Refractive Surgery Center. 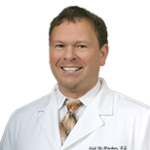 Dr. McMackin is responsible for overseeing the clinical operations of the center and consulting patients on refractive surgery. He also works closely with our network of optometric physicians who provide pre-operative and post-operative care following laser eye surgery. Dr. McMackin is a member of the Optometric Association and a member of the NC Optometric Society. He has lectured and published on a variety of topics, focusing primarily on refractive surgery issues.